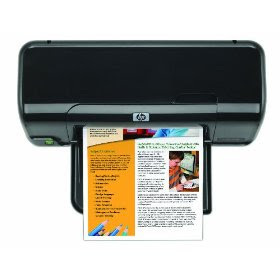 You are here: Home � All Deals , Electronics: Computers Video Games GPS � Get a Deskjet D1660 Printer made by Hewlett-Packard for only $29.99 shipped. Get a Deskjet D1660 Printer made by Hewlett-Packard for only $29.99 shipped. Amazon.com is selling the Deskjet D1660 Printer made by Hewlett Packard for only $29.99 shipped to your door. This printer gives laser quality prints while using original HP ink. It doesn't take up much desk space with its streamlined design. It can be outfitted with higher capacity cartridges upon refill that will allow 3 times more printing per cartridge. This product has a 4 and a half star review out of five on Amazon, and lastly this printer is Energy Star certified, so save electricity when you print.